If you appreciate world-class refinement (along with impressive mileage), and you're looking to spend anywhere from $16,000 to $24,000 for a new car, your test-drive schedule might not continue past the Honda dealer. Honda Civic it is efficient recommended price value is reasonable for anybody. Driving a Honda Civic it has a good fuel mileage you can carry up to 5 passengers in the car. It is a comfortable vehicle to be in and it is not expensive car to purchase it is a reasonable price that you can afford. Especially you get a lot of power out of the vehicle it has an extremely low maintenance costs it is easy to understand the nav system for the oil change it only needs to be changed every 5, 000 miles. Throughout the experience that I have had in this it is comfortable and sophisticated it is a fun car to drive especially with the manual transmission it makes a big difference in fuel consumption. In this car it has an AUX cord where you can plug your phone to play music and the speakers of this car it is decent to hear and throughout the whole car. I haven't had any type of issues with this car in the last couple of years everything is about maintenance and always checking on it there has not been any type of malfunction. Upon many people I have always checked on people's opinions to see what they said about owning this type of vehicle and the rating that people have been giving, for power, handling, looks/style, front seats, back seats, cargo capability, family, value, and purchase is a recommended for everyone to get for themselves. I am a huge of Honda Civics vehicles that they have developed and it is companies high reputation. Reliability and comfort! Perfect car for myself. I believe Honda's are very reliable. I rarely have issues with it besides the typical maintenance. It is a easy smooth drive and I love that my speed is digital. I have the basics that I need like an AUX cord, cruise control. My car is also pretty cheap to fill up with gas and my gas last a while. Repairing my car if needed has always been in a reasonable price range which helps my budget. I feel like it has plenty of room for anything I need. I have even been able to fit a 60 inch TV into my car. I think the Honda Civics are a great size to fit into any parking spot without being to small of a car. One thing about my car is it does not have pockets on the back of the seats but that is of course no deal breaker. I just like extra storage. I could also see if you were a pretty tall person it could be hard to get out of the car and have your legs in a comfortable position. When I take my car to get repairs I usually take it to the Honda dealership and they are very helpful and good at what they do which I feel like it is a perk of owning a Honda. I would continue to buy Honda's and I like most of the sedan models. I always recommend my car to anyone who is looking because I think it is a very reliable car that has been perfect for myself. I and very comfortable in it and do not see myself changing anytime soon. Test drivers said the 2009 Hyundai Elantra not only has comfortable front seats. 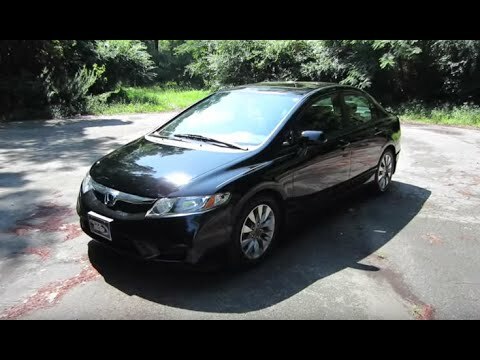 When it was new, car reviewers said you couldn't go wrong with the 2009 Honda Civic. They said that it not only looks sleek on the outside, but it also has great interior quality. The Civic has excellent crash test ratings, though several safety features, like electronic stability control and traction control, only came with higher trims. Test drivers also applauded the Civic for its quiet, smooth ride and good fuel economy. The base Civic coupe and sedan have a 1. 8-liter four-cylinder engine. Reviewers found the Civic is, which has a 2. 0-liter engine, particularly fast and agile, but said the base engine would work for most buyers. The Civic does not have many standard features, though, and you'll have to choose a higher trim to get standard air conditioning and a radio. Available features on the Civic include air conditioning, a radio, an auxiliary jack, cruise control, navigation, satellite radio, Bluetooth and a USB port.